Wild Kidz is a child’s first step into the BCWF’s Youth Program. Caught somewhere between a typical summer day camp and an overnight nature camp, Wild Kidz offers children ages 9-12 the chance to play outside and develop wilderness skills. Each camp shares base programming such as shelter-building, fire-building, orienteering (compass work), and outdoor education (e.g. bear-aware and hug-a-tree programs) combined with a small science curriculum each year. However, each Wild Kidz is unique because programming is developed around the host community’s attractions and resources. Activities range from local ecological attractions – like provincial or national parks – to BCWF members providing programs or demonstrations of their outdoor-related talents. Lastly, each Wild Kidz includes a Range Day where campers learn about gun safety, hunting and conservation ethics, and the proper handling and shooting of firearms. This year, we reached a total 94 children in the communities of Castlegar, Dawson Creek, and Abbotsford. Camps were offered at minimal cost with lunches were provided each day. Each camp shared some base programs; however, each camp was designed with place-based programming. Place-based programming incorporates local attractions and venues in developing a program. By using this design concept, each Wild Kidz camp was unique and allowed campers to discover local “eco” attractions that some never knew existed in their community. Examples of place-based programming in 2018 include fishing at local lakes and rivers (both from shore and on boats), visits to local hatcheries, local hikes, and an interactive conservation and hunting ethics workshop from the local Conservation Officer Service detachment. Wild Kidz visited Castlegar for the first time from July 24 to 28 and was hosted by 3 clubs: the Castlegar and District Wildlife Association, the Trail Wildlife Association, and the Silver City Trap Club. Castlegar was the first camp of the year and second largest with 31 participants! The camp was primarily held the Silver City Trap Club. The venue offered many opportunities for the campers including fishing on Columbia River and examining a wildlife secondary succession area. Campers benefited from the experience of various club member including the club caretaker, Ron Ready, who taught the camper about local invasive species (knapweed) and how they are being naturally controlled by a local weevil. 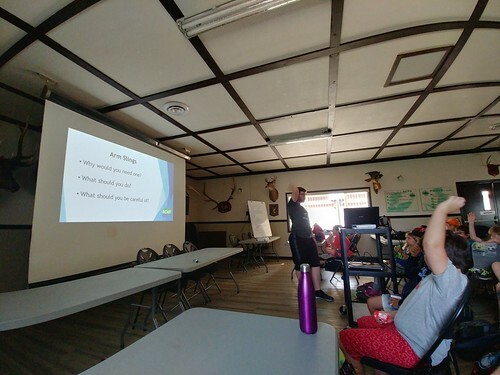 During the camp’s Range Day, Ron, along with Trail Wildlife Association members, conducted a condense PAL course for the camper before they were taken to the Trail gun range. At the range, campers were taught to fire a variety of .22 caliber rifles and NASP archery. Other camp activities included shelter building, fire building, bear safety, waterfowl education, fishing 101, and a 2-hour hike led by club liaison, Lawrence Redfern. 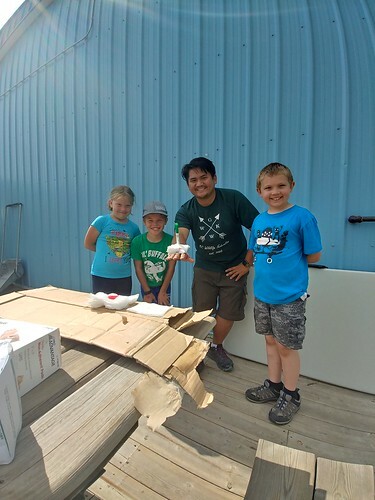 Wild Kidz Castlegar ended with a camp barbeque, archery contest, and conservation project where each camper constructed a nesting box that they took home or left for the Castlegar District Wildlife Association to install. Wild Kidz visited Dawson Creek from July 30– August 3, 2018 and was hosted by the Dawson Creek Sportsman’s Club. Dawson Creek was our largest camp of the sumer with 32 campers! Wild Kidz Dawson Creek was a pilot project as it was the first BCWF camp to feature an overnight component. The purpose of introducing an overnight component was twofold; (1) to provide participants with important outdoor skills such as using a camp stove to cook their own dinner and learning how to set up their own tents, as well as (2) to bridge the gap between summer day camps and weeklong overnight camps through providing a one night overnight experience aimed at introducing youth to overnight camping. The overnight component was a success on both counts. For many campers, the overnight component was the first time they had been given the support and responsibility to exercise their camping skills. It was also a manageable introduction to overnight camping for participants who had not had an overnight experience previously. Dawson Creek campers were introduced to boat fishing on an excursion to One Island Lake, took part in a sharpshooting competition organized by the Dawson Creek Sportsman’s club, participated in several conservation sessions on topics such as fish biology, waterfowl conservation, and ungulate management. Dawson Creek’s conservation project, building bird boxes to support the local wood duck and swallow populations. Hosted by the Ridgedale Rod and Gun Club, Wild Kidz visited Abbotsford for the first time from August 20-24. Abbotsford was the final camp of the summer and in addition to the phenomenal support from the club, was also supported by a pair of youth volunteers who had participated in the Go Wild! Youth for Conservation Program in years past. Abbotsford was the smallest of our camps this year with 28 participants. Despite being the smallest camp, Wild Kidz Abbotsford was the most diverse and engaging camp of the summer. In terms of firearm education, campers were introducing to a wide variety of firearms which include .22 rifles, .22 pistols, and 20-gauge shotguns. 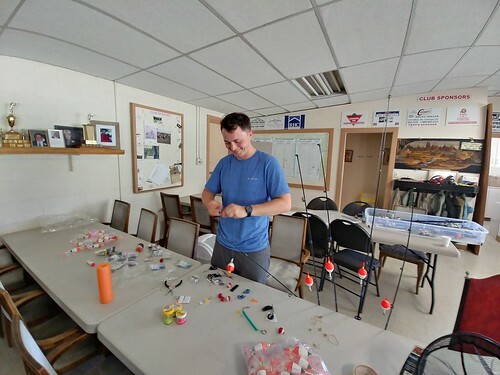 For our fishing component, campers were brought to the Fraser Valley Freshwater Fisheries Hatchery where they learned in-length the process of stocking BC lakes. Locally, the Backcountry Horseman of BC (Fraser Valley club) provided an equestrian workshop which taught campers proper horse care and preparation. For the camp’s conservation project, Wild Kidz partnered with the City of Abbotsford to install swallow boxes as well as plant native trees at Willband Park (a local wetland). Last but not least, Wild Kidz Abbotsford was the second camp to have an overnight component. Get kids outdoors! Support Wild Kidz TODAY!